For the purpose of combating terrorism states do not only criminalise activities well in advance of a terrorist act. They also rely increasingly on interventions aiming to prevent or reverse “radicalisation”. Though the concept is contested, the prevention of “radicalisation” has become a testbed for censorship, propaganda and the co-optation of civil society engagement for a governmental rationale. How can we meet the challenge of an allegedly increasing threat by Islamist extremism? Along with repressive police work against “persons posing a threat to public security”, prevention is seen as most important instrument. However, neither the role that security agencies play in the context of preventive work nor, more fundamentally, the quality of this kind of prevention as practice of government is questioned. “Males are the key target group of exit programmes for neo-nazis. They are seen in particular in the light of their deficits: being violent, criminal and ideologically radical”, says Esther Lehnert, professor at the Alice Salomon College in Berlin. Dirk Burczyk talked to her about parallels between programmes for neo-nazis and those for jihadis and Islamists. IT corporations shall remove “terrorist” internet content and online hate speech. Accordingly, the German parliament has adopted a new law only recently. The EU is also promoting the privatisation of law enforcement through its Internet Forum. The British PREVENT programme has created a system of collective snooping and snitching due to its duty on public services to report suspected “extremists”. The result is a climate of fear and stigmatisation. Despite significant critique and protests, the UK government is planning to tighten the rules. In order to prevent them from influencing others, since 2006 “terrorist suspects” and convicts in the Netherlands are detained in special sections of two prisons. At the moment, about 30 persons are held there. Deradicalisation is not an official objective of the prison system and the staff has little experience with it. In 2016, German police officers have shot 52 times at persons and 28 times at objects (as these were mostly vehicles the police indirectly targeted also the passengers). 13 persons died and 28 were injured. Police in several German states are using software to predict burglaries. The Federal Criminal Police Office aims to assess the risk of “persons posing a threat to public security” with a similar tool. Studies evaluating the effectiveness of the new methods do not exist in Germany. Rather the tools prove to be biased. As the source code is not revealed by the producers it is unknown how the software actually works. Thus, German data protection commissioners are concerned. “Our goal is a lean but strong state”, claims the Alternative for Germany in its party manifesto. The significant reference to “internal security” which is made by the new right-wing party fits in both with the authoritarian concept of statehood in its nationalist thinking and with its neoliberal visions of society. Moreover, the reference serves as a bridge to the centrist parties, in particular to the Christian Democrats. The German police, in particular the Federal Criminal Police Office, aim for an increase of powers in the area of DNA analyses. They are supported by the ministers of the interior and justice. In late June 2017, the German parliament amended the Code of Criminal Procedure, authorising “familial searching” in the context of DNA mass screenings. Under discussion is also forensic DNA phenotyping which promises to determine the colours of a persons’s skin, hair, eyes, his or her age and the “biogeographic origin” from stains found at crime scenes. More than 23.000 police officers made the G20-summit the biggest police operation in post war-Germany. From the very beginning, the police was heading towards escalation: Banning big camps, interfering demonstrations or dispersing them violently. There was an ongoing use of water cannons and pepper spray. The riots on friday, 7 July, were countered by a SWAT team. 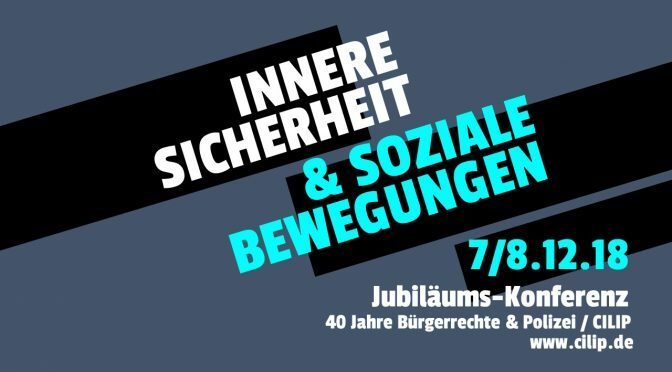 Still 76.000 attended the mass demonstration “Solidarity Without Borders Against the G20” (Grenzenlose Solidarität statt G20) on Saturday (8 July).